If you want to pack as much muscle on your body as you can and become much stronger in the process, you should be focusing on compound lifts. That way, you will be activating a number of muscle groups as well as joints, so your body will work with as much synergy as possible which will, in turn, make you stronger because of its united approach to tasks. If you’re tired of being weak and want to make yourself look and feel more powerful, you should definitely focus on the standing overhead press. While this may seem like common sense, a lot of people are getting stuck on their overhead presses, but instead of using all that power to lift the bar, you can trick out your standing overhead press with a few simple modifications. Let’s get started. People usually think of the standing overhead press as an exercise that concerns the upper body, so they don’t really put in any effort in their lower body muscles when doing it. If you have insufficient glutes and if you don’t even tighten them up, the risk of you getting hurt is far bigger, especially when you move your back to a bowed position. This is a huge mistake and with that much weight above you it can even be deadly. When you bow, that means that your body is trying to alleviate some of the pressure and yet still get that weight up in the air, but it has some negative consequences too – you lose some power and drive, meaning the effects won’t be the same. If you’re standing, you want the body to be well supported so you don’t fall down and have enough power to lift the barbell up. So, when you do standing overhead presses, make sure to tighten your glutes as much as you can when you press the barbell above you. You aren’t starting from scratch – use what you already have and practice decent form – you’ll be becoming stronger in no time. 2. Slightly Move Your Head Forwards! When you press the weight above you, allow your head to move a little bit forward. Even though some lifters try to keep this from happening, you should still do it because they’re wrong. This motion is perfectly natural and it goes with the flow of the exercise. If you don’t move your head a little bit forward, you will be doing the same thing as with your bowed back from the previous tip – you’ll be throwing your body out of balance and alignment. 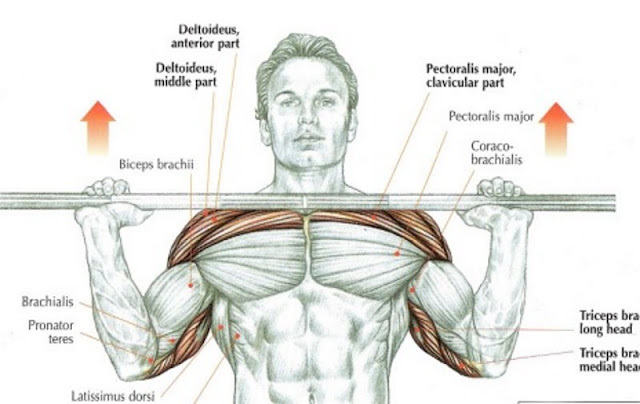 This will make your lifting that much harder, so make sure to let your head move. When you do it, it will fix your balance issues that you’ve probably been having if you haven’t allowed free movement of your neck, but it will also make all of your movements in that exercise feel a lot more free and comfortable. Because you don’t want to get injured when you’re lifting that much weight over your head, you need to find a solid range of motion that will let you move your head backwards and forwards without any problems, just so you can move on from one repetition to the next. When you’re doing standing overhead presses, make sure to pay attention to your back – you really need to watch it in order to avoid getting hurt. When you hold a large amount of weight straight up like that, your spine gets a lot of pressure, but if you contract your core muscles, you’ll have a base from which to exert force and lift way above your head. When you tighten your core muscles, it’s much easier to exert force through your shoulders, arms and finally hands and lift the weights. Also, you’ll be far less prone to back injury because the core muscles keep your vertebrae in the proper alignment – you won’t break your spine. If you have a weak core, don’t attempt lifting weights above your head. You won’t improve anything and you might just end up in a hospital. However, you can always use your core muscles in a way that will let you build a strong base in your body that will later allow you to lift a lot of weight right over your head. When you’re exercising, another thing that should be going through your mind is to keep your elbows down and as close to your body as possible. Tuck those babies in so you don’t hurt yourself, which is easier than it sounds. When you do standing overhead presses, you put a lot of pressure on your shoulder joints, which can cause pain with relative ease and even injury if you mess up enough. Your shoulders are incredibly complex and fragile since they have a lot of ligaments and tendons which are susceptible to injury, which means you have to pay extra attention to not hurt it. Proper form should be practice at all instances to avoid getting hurt, but also to prevent and avoid tendonitis. When you keep your elbows down and towards your body, your shoulder girdle will be correctly aligned, which means you can then lift the weight straight up when you keep it in its strongest possible position. Do this one thing and see if your lifting abilities don’t significantly improve – they will, and you’ll notice it. When you’re working out and you come to the standing overhead press, notice your wrists and how they’re positioned. Usually, people won’t care about the wrists while being fully focused on their core, back and shoulders, but even though they are very important, you need to take care of your wrists as well, for alignment if not for anything else. When you exert force, you do it through the wrists, so they need to be completely straight to channel all that force into the weight. If they’re even a little bit bent, they won’t fulfill their full potential. Like all other parts of your body, you should keep your wrists as tight and as clenched as possible when you do overhead presses. Keep them in a way that will make a straight line with your forearm, but if you don’t think you can hack this and you’ve failed to keep them straight time after time, you might just have weak wrists. To remedy this, add some wrist curls to your workout schedule and in a few months you’ll be set. Your presses shouldn’t be alone forever – they are an intense group of exercises and they put a lot of pressure on your lower back as well as your shoulders. If you feel fatigued by overhead presses, reduce the time you spend training them and do it once for every few weeks. Meanwhile, put some other exercises in your schedule that will make you better at overhead lifts. With enough time, you’ll make yourself good at those exercises because you’ll become stronger and more powerful. To switch up your exercise routine, I suggest adding some dumbbell shoulder presses, Arnold presses or seated shoulder presses instead of the overhead press. All of these will make you stronger when you start doing the standing overhead press again, so your progression won’t stop and you’ll constantly become better. When you’re not doing overhead presses, you are lowering the chance of hurting your back or your shoulder joints, which is usually an injury that gets you out of the gym for weeks on end. However, if you mix it up, you could keep training and keep getting results. Well there you have it – a few tips and tricks to help you make your overhead press as beneficial and as powerful as possible. Progress is right in front of you, you just have to reach out and grab it by putting more and more weight on the barbell over time. Getting better at compound exercises such as the overhead press means that you’ll be becoming stronger, more powerful and all around better, but you have to remember everything that will allow you to do so. If you keep all of these tricks in mind, you will be well on your way to achieving great results and breaking through your glass ceiling with pride.